American workers cranked out their highest rate of productivity in nearly four years, the Bureau of Labor Statistics said. Productivity increased at an annual rate of 3% in the third quarter, with a 4.7% gain in output and only 1.7% change in hours worked. Labor costs declined for the quarter, indicating lack of pressure for inflation. 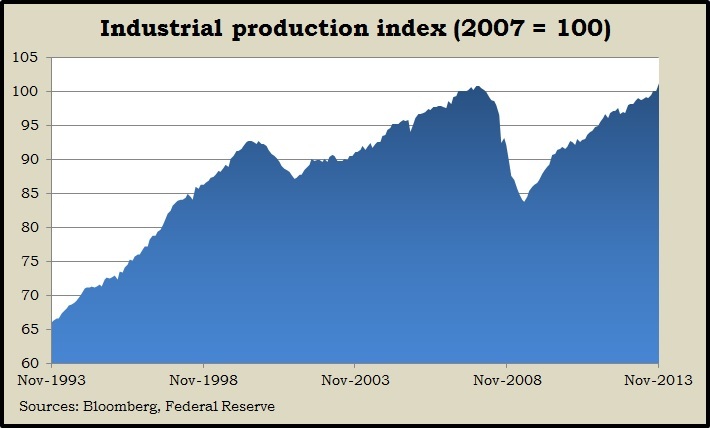 U.S. industrial production finally recovered and surpassed its peak from before the Great Recession, according to the Federal Reserve. Gains in November were larger than expected with manufacturing up for the fourth month in a row, led by auto making. Capacity utilization also expanded to the highest level since June 2008 but remained short of the long-term average, at which point inflation becomes more imminent. Another sign that inflation still is not a threat was the 1.2% 12-month increase in the Consumer Price Index in November. Even adjusting for falling energy prices, the Bureau of Labor Statistics’ core CPI measured 1.7% year-to-year. That’s below the 2% target at which the Federal Reserve considers the U.S. economy to be growing sustainably. After stumbling recently, the housing recovery seemed more on track in November with housing starts and building permits rising more than expected. The Commerce Department said more than 1 million houses began construction in November, including single-family residences. Building permits, a leading indicator, dropped slightly from a five-year high in October. The National Association of Realtors blamed higher mortgage rates, stingy supply and tight lending for the fourth monthly dip in existing home sales in November. It marked the first time in 29 months that the rate of home sales fell from the year before. Demand for housing remained solid, pushing up the median sales price. And even with recent declines, the Realtors expect 2013 to be the best sales year since 2006. The moving four-week average for initial unemployment claims rose for the second week in a row, the Labor Department reported. But average claims continue to lag the 46-year average, suggesting a reluctance by employers to let workers go. The Conference Board’s index of leading economic indicators gained more than expected in November, suggesting gradually strengthening economic conditions in 2014. Employment, new factory orders and stock market increases contributed to the rise in the index. Tepid consumer confidence from and bumpy housing data suggested concerns for the economy. The U.S. economy grew faster than expected on improved consumer spending in the third quarter, as the Gross Domestic Product rose at a 4.1% annual rate. That was more than the Bureau of Economic Analysis had earlier estimated, more than analysts had forecast and more than the 2.9% 30-year average. The bureau said consumer spending – which drives 70% of economic activity – advanced by 2% in the quarter, largely on services such as health care and recreation. The Fed’s preferred inflation indicator showed a 1.4% annual rate, below the Fed’s target of 2% as well as the 30-year average of 2.4%.